This week we’ll get deeper into the workflow of formatting your novel. I will use Word 2013 as my word processor, even though the recommendations and steps will largely apply to any recent version of Word or comparable programs. Additionally, we’re not going to deal with embedded images for now. They add quite a bit of complexity, mostly due to the variety of devices that your eBook can be read on. We will deal with images in a future article. Without a doubt, the single most important piece of advice I can give you when it comes to formatting your work, is to start with a clean Word document. In other words, the work of formatting your document starts as you write it, not when you’re done. A clean document is one that avoids, as much as possible, any direct text formatting. While it’s Ok to apply formatting such as bold and italic, you should avoid at all costs formatting such as font size, color, paragraph spacing and indent, page margins, tabs or spaces to align text, multiple paragraph marks to go to next page, page borders etc. The reason is because all these settings translate very poorly to an electronic format that can be read on a multitude of devices. Additionally you will want to leave the reader in control of settings such as font size and font face. Before we start, I want to briefly explain how Word deals with text formatting. 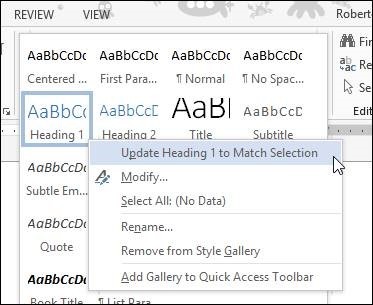 Word uses Styles to define how text will look like. A Style is a collection of properties such as font size and color, paragraph spacing and indent and many, many others. You use different kinds of Styles for different kinds of texts. A Style for the body of the document, a Style for the chapter titles, etc. If you want to change the look of a particular kind of text, you simply change the Style definition. 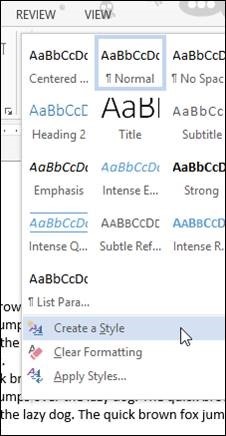 In a single step you will have changed the look of all the text and paragraphs with that style in the document, without having to manually change each individual piece. This is a very powerful feature in Word, unfortunately is one of the least used and understood. Understanding how this works will make your life much easier later. The good news is that when you start a new document, Word already gives you most of what you need. The “Heading 1” and “Normal” Styles are already defined and you should use those to begin with. I will show you how to define the other two. For this first part I am going to assume that you’re starting your novel from scratch with a new document. That will give you a basic understanding of the process. In the next article we’ll have a look at how to turn your existing document into one that can be easily formatted. The first step is to create a template that we will use for all of our future novels. The initial part is always the same, so let’s do it once and for all. Let’s start by creating a new document in Word. Write “Chapter 1” and press Enter, then write two full paragraphs separated by paragraph marks. Make sure you write enough text so that the paragraphs wrap around. The first thing we want to do is define the style for the paragraphs of the novel. We will first change the formatting of the first paragraph in the text to what we want, then update the definition of the Style “Normal” to reflect the changes we made. This way everything that is formatted Normal in the document will look exactly like we want. Let’s start by right clicking on the second paragraph and select “Paragraph…” This will open a dialog box that will allows us to change the paragraph formatting. · Under Indentation, Special, select “First line” from the drop down and enter 0.2” where is says “By”. Press the Ok button to close the dialog box and get back to the document. Now the first paragraph will show a small indent and no spacing after it. We want to change the definition of the “Normal” style to reflect that. 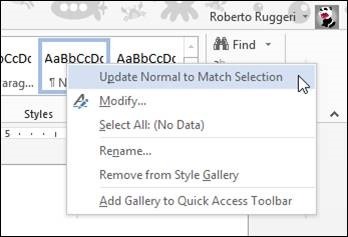 To do that, right click on the Normal style in the toolbar and select “Update Normal to Match Selection”. Once you do that, every paragraph in the document will change to show the formatting we just applied. Since every single paragraph is formatted as Normal, this is expected and a good thing indeed. The last thing we want to do is create a style for the first paragraph in each chapter. When not specified otherwise, the Kindle reader will automatically apply a paragraph indent. This improves legibility and it’s generally a good thing. It’s also good habit to have the first paragraph of each chapter indented at 0”. 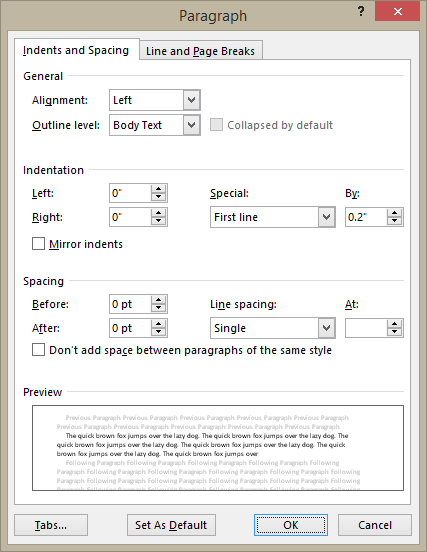 To do that, right click on the first text paragraph in the template, right after the chapter heading and select “Paragraph…” Under Indentation, Special, select “(none)” and then press Ok.
To define a new style based on the new formatting, open up the list of styles and select “Create a Style”. Name the Style “First Paragraph” and press Ok to add it to the list. Now you can save this document and use it whenever you want to start writing something. Just make a copy and use it as a starting document. This way all the styles will be already defined for you and you can concentrate on writing right away. As a bonus I have shot a short video to show you how to do it, and I have uploaded a document template here where I have already done all this for you. In the video, I also show you how to define a fourth style for centered text, used mainly as a separator between paragraphs when you do not need a new chapter. Next time we’re going to look at converting an existing document into a format that will be easier to format. See you next time. If you have any questions ask Monica or me @robertoruggeri.